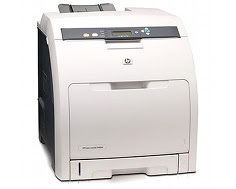 The HP Color LaserJet 3800 is a fast, reliable and reasonably priced laser printing solution that is suitable for small business and home office use. Speed and decent print quality make this printer a viable solution for those who wish to have an easy to configure, easy to use printer that is ready to go right out of the box. Whether your goal is to print professional-quality documents or vibrantly colored photographs, this printer has the goods. The HP Color LaserJet 3800 prints at a top speed of 22 pages per minute, whether printing in black and white or color, regardless of the quality desired. This printer offers consistent performance at any setting, whether it be default, pre-defined or custom. For both color and black and white printing, the time for the first page to print is 12.5 seconds, which includes warm-up and pre-print maintenance. The internal processor runs at a speed of 533 MHz and can handle the most detailed graphic image handling and reproduction. A recommended duty cycle of 65,000 pages per month is approximately 35 to 50% higher than lower end laser printers, ink jet printers and all-in-one units. This machine's laser printing technology yields a print quality of 600 x 600 dots per inch in both color and black and white. Three paper trays can hold up to 850 sheets of paper utilizing customization and upgrade options that are available for this model, allowing for approximately 38 minutes of printing at top speed without having to replace paper. There are a variety of media types and sizes that this unit can handle and the maximum media weight is 58 pounds, which far exceeds the capabilities of most industrial copiers and printers. Printer memory is expandable to 544MB via one DDR-SDRAM 200-pin SODIMM slot. This upgrade option provides convenience and cost effectiveness by allowing a user to purchase PC-compatible RAM from any number of suppliers in 128, 256 and 512 MB increments. An optional 20 GB hard drive allows for on-board storage of thousands of documents and images that can be accessed and printed at any time. A wired USB 2.0 compatible connection allows direct hookup to a PC and printer sharing through Windows network resource management. This printer's output capacity is only 200 pages, which is less than 25% of the total input capacity, requiring a user to have to empty the output paper tray every 9 minutes during continuous print jobs. An envelope feeder is not included, so it can be difficult getting accustomed to printing envelopes, as they need to be placed in the manual feeder with the proper orientation. This can lead to envelope and toner waste while becoming familiar with how to properly load envelopes. The paper input trays that come standard with the base model only hold a maximum of 350 sheets combined, 100 of which are held in the multipurpose tray and 250 that are stored in the regular paper input tray. The 96 MB of RAM that comes standard on the base model is more than enough for text document printing but can become overwhelmed quickly with color image printing, which can significantly reduce the top color printing speed. No Ethernet capabilities are available in the base model, so purchasing customization options that include an embedded Ethernet print server for office networks will increase the overall cost dramatically. The cost of consumables is slightly higher than average for this model, the price of replacement toner resulting in a higher cost per page. 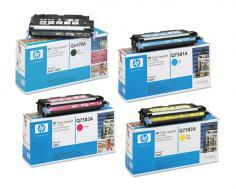 Review it: "HP Color LaserJet 3800 "
The HP Color LaserJet 3800 ships with a start-up toner bundle of one black and three color cartridges, each with a 6,000 sheet printing capacity. 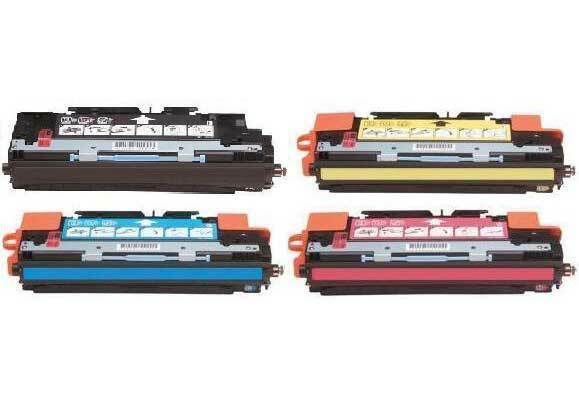 Replacement toner cartridges can be purchased but are slightly more costly than cartridges for other models, and they also hold a 6,000 page yield. 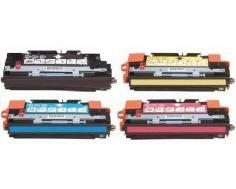 The included start-up cartridges are a good value, as their worth decreases the overall cost of the base unit by about 50%.